Thin in the labial region, where there is never sufficient room and thicker in the oral region to afford the necessary strength. The metal frame was made such that it could be completely relined in the future, thus avoiding pressure points Assessment of available space using silicone key. As per the patient’s wishes, we were able to avoid any transversal connectors. Another ‘try-in’ of all the metal pieces took place: The base, with the glued primary parts and keys, the Gold caps on top and, finally, the CrCo base. 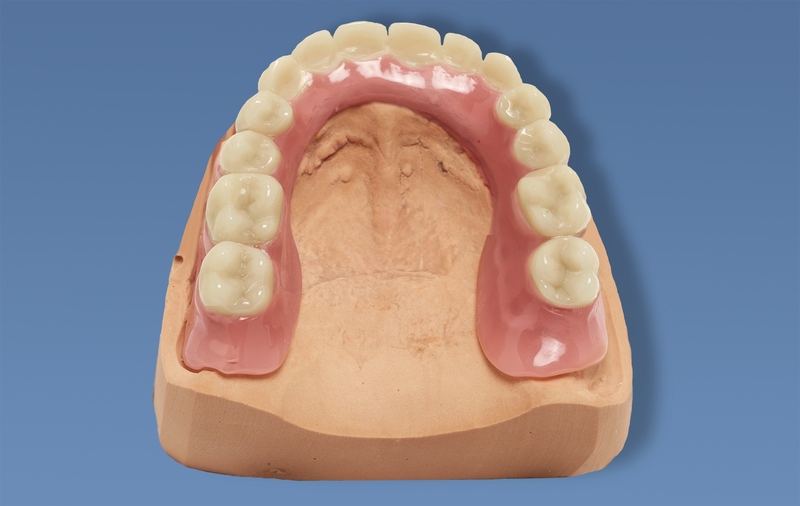 The model cast showed an identical fit on the master model and in the mouth of the patient. It was now ready for completion. Back in the laboratory, finishing was carried out in the conventional way, after all exterior surfaces had been coated with Silane and covered with opaquer. Finally, all adhesive surfaces were prepared by using Aluminum Oxide 100 micron and degreased prior to intraoral cementing. The technician’s role was done. A note on the final fitting: In order to prevent stresses, the cementing (the caps with the frame) should only happen intraorally in pairs. 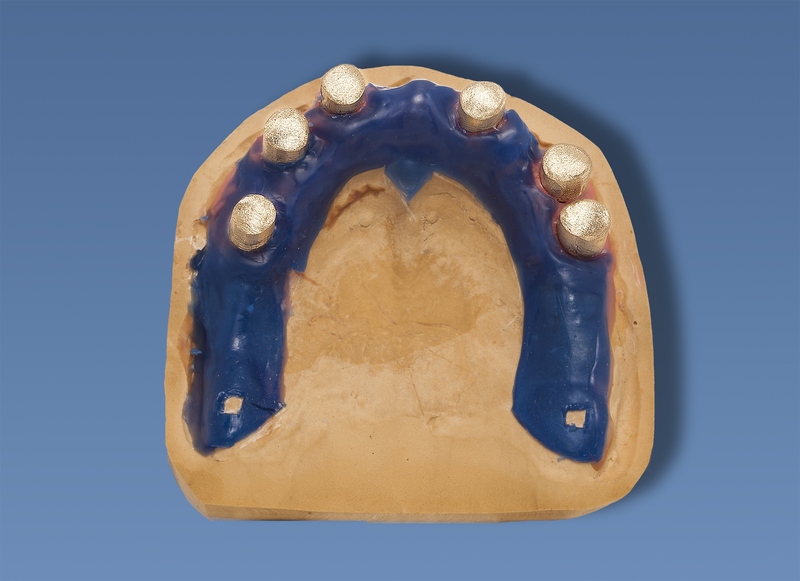 Beginning at the distal end, the secondary crowns were cemented in in opposing pairs. The remaining 4 and/or 2 stayed on the primary parts. „My new denture is pleasant to wear. 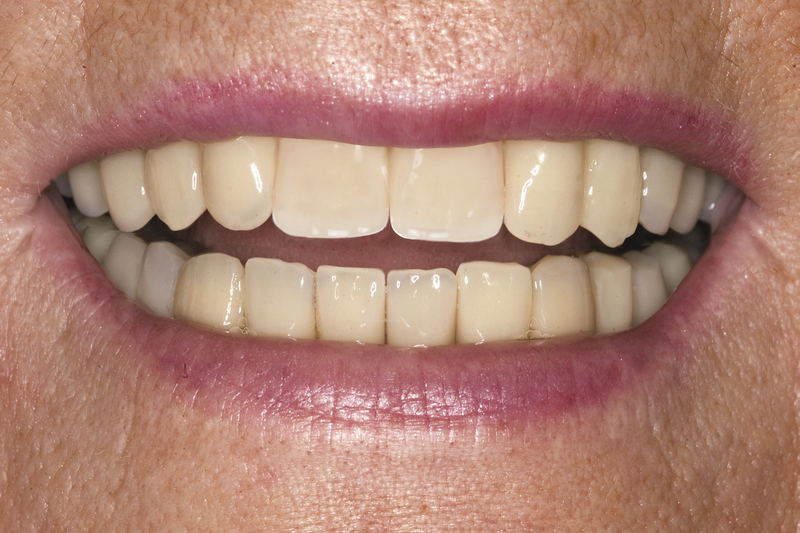 I am particularly happy that I no longer have bars on the roof of my mouth – that always bothered me about my old denture. Finished Finished Implant Work seen from aboveI believe that this result was only made possible by the close cooperation between my dentist and the dental technician; from the initial planning through to completion. The entire prosthetic treatment could be done with relatively few appointments. 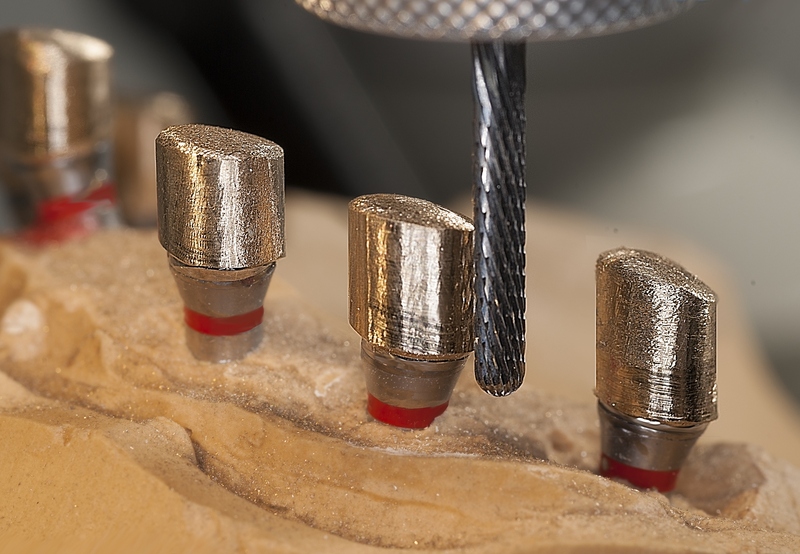 Trying-in was problem-free, although time-consuming as each time the Abutments had to be set up and removed. A suitable key can save a lot of \’trial and error\’.The acclimatisation phase was extremely short for the patient as she had already had a telescope denture in the past. The absolute rigidity of teeth implants firmly anchored in the bone, compared with flexibly attached natural teeth, felt unusual at first. 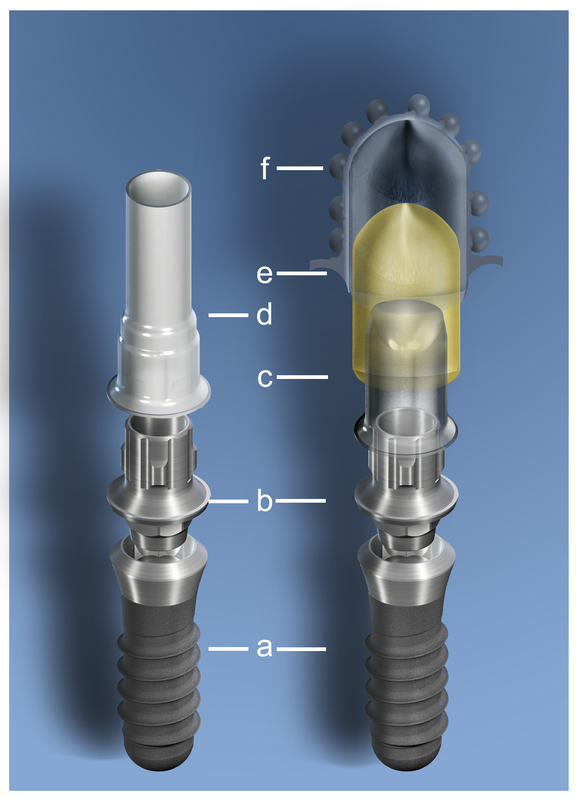 It r equired an even more precise insertion and removal of the prosthesis. 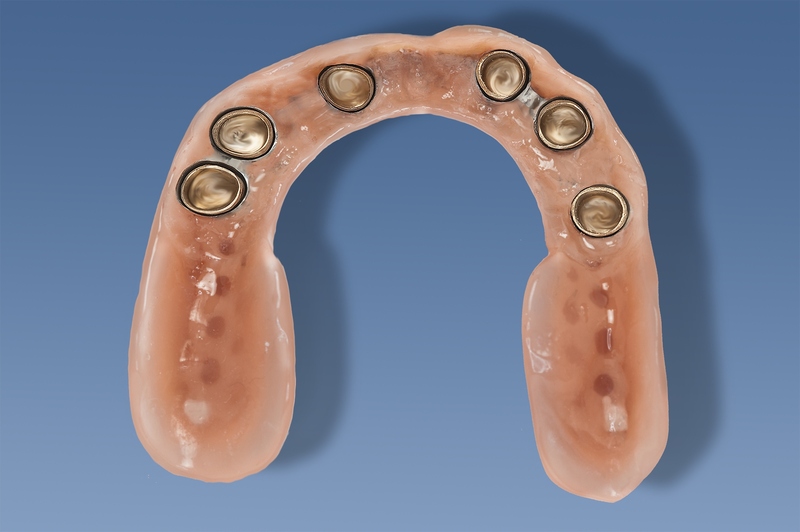 Conclusion This method of implant treatment for edentulous patients offers a really good, stable, yet unobtrusive solution. Complex surgical interference with augmentation can also be avoided. 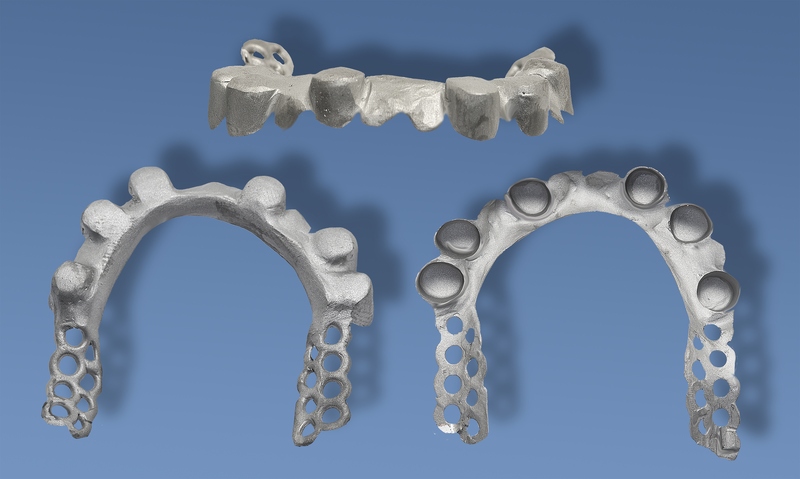 Clearly, it is possible to treat difficult cases in a truly effective way (here: Kennedy Class one: as „removable bridge “), by using implants and telescopes together. abutment teeth, claps, Crown Overdentures, Dental, dental Laboratory Ulrich Heker, dentist, friction, Full mouth restauration, German Crown, Germany, High end, Implants, overdenture, private dentistry, removable denture, RSS, Teeth Are Us, Teethrus, Teleskopierende Brücke, Ulrich Heker. Lesezeichen.